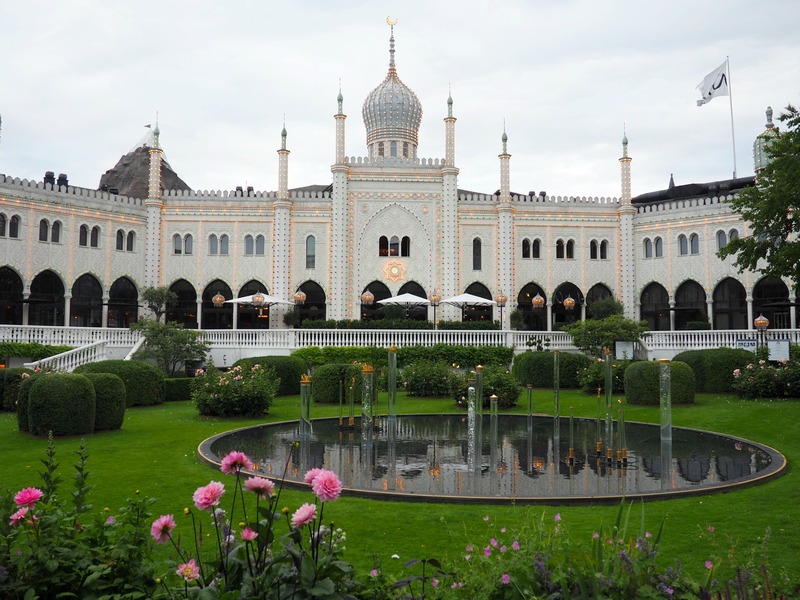 The place in Copenhagen I’d heard the most about, which turned out to be our favourite part of the city, was Tivoli Gardens, the second oldest amusement park in the world that has been one of the city’s main attractions since 1843. It’s a pretty random attraction to have right in the centre of the city, but inside we were taken to a whole different world as we wandered through the park bursting with colourful Japanese gardens, Egyptian decorations, pirate ships floating on the lake and runaway trains circling the snowy mountains (fake mountains of course). The Gardens are huge and could honestly keep anyone occupied for an entire day with an open air theatre, live music, a huge range of restaurants, lots of fairground games and rides including a big rollercoaster that Mr Ayla couldn’t seem to stop going on, and one of the most fairytale-esk hotels I’ve ever seen. We stayed until dark to watch the Tivoli Illuminations, a colourful light show over the lake, to end off a fun day spent in the most magical part of Copenhagen. Another part of Copenhagen that can’t be missed is Nyhvan, and there is good reason this is the most photographed part of the city. The harbour front is lined with rows of bright colourful buildings, with bars and cafes setting up tables and chairs outside where we grabbed a drink and watched the boats bobbing in the water as tourists bustled past. Around the corner from Nyhvan is another small harbour where we stumbled across some deck chairs (completely free!) all set up along the deck for people to sit on and enjoy the sunshine. 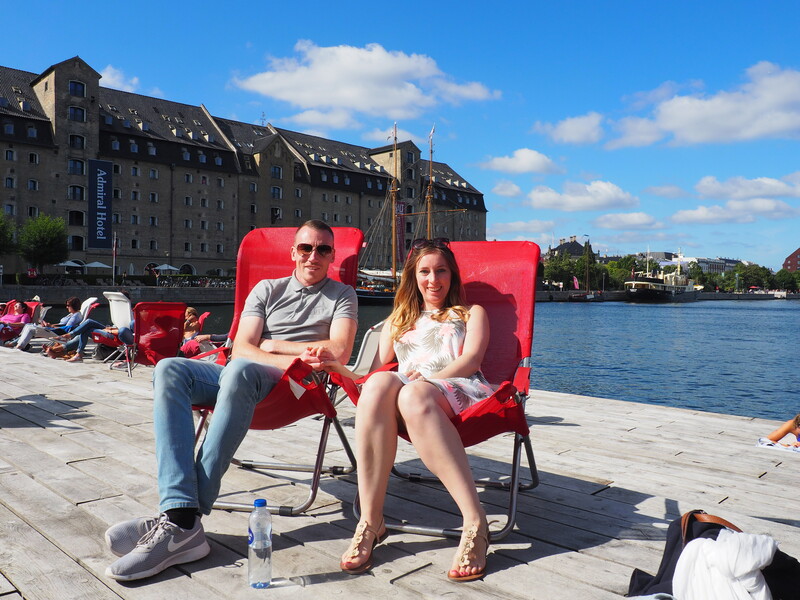 There was such a relaxed and friendly atmosphere that we felt completely at home here and I almost drifted off to sleep under the Scandinavian sun. 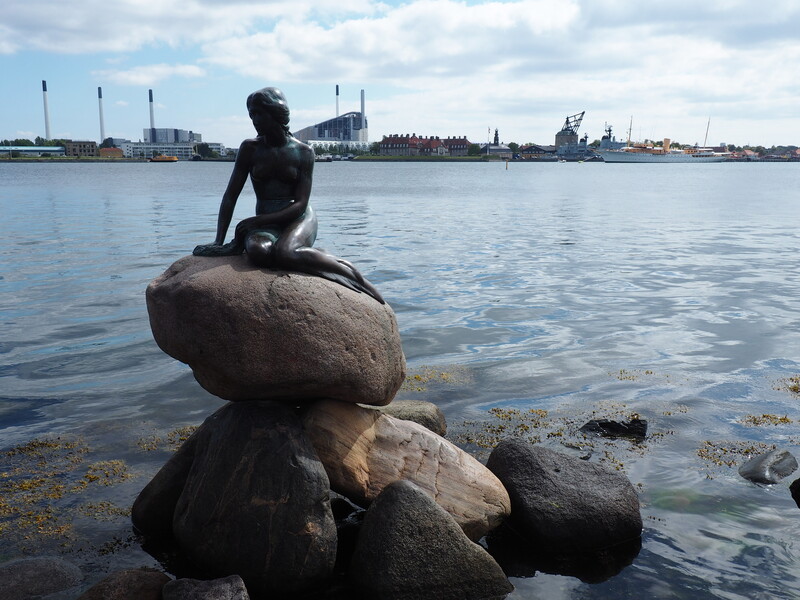 To this day The Little Mermaid is my number one Disney movie and even though the famous Little Mermaid statue that sits in Copenhagen’s harbour is based on Hans Christian Anderson’s version rather than the red-haired Disney princess, I still dragged Mr Ayla to see it anyway. Tourists flocked around it all trying to get a photo, some people even attempting to sit on a rock to imitate the mermaid themselves! 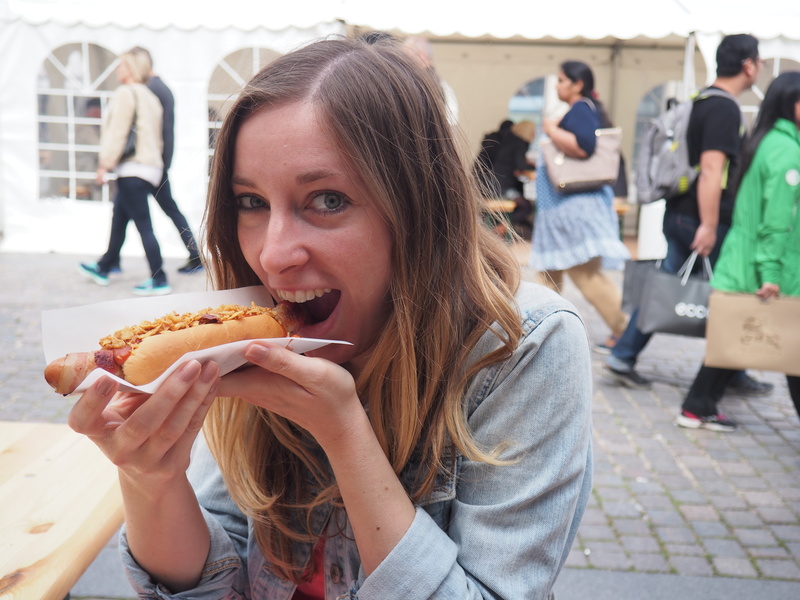 Neither of us are massive fans of Danish food and because eating just a basic meal in a restaurant will empty your purse out quite a lot in Copenhagen, we tended to stick to more simple places as well as lots of street food. We couldn’t resist the lure of the popular hot dog stands that are on every corner – and I’m not exaggerating when I say every corner. We couldn’t wander for more than a few minutes without coming across somewhere else offering some tasty hot dogs. 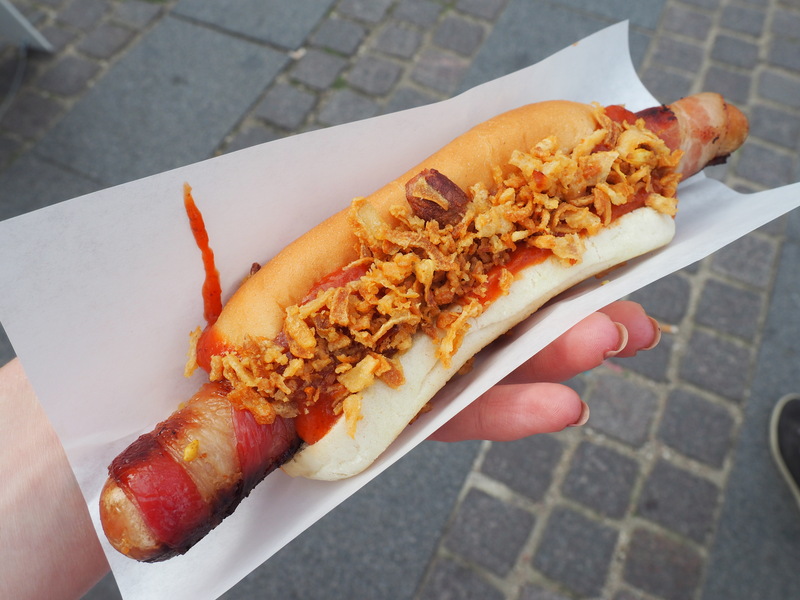 My absolute favourite part of a roast dinner is the pigs in blankets so when I found a hot dog wrapped in bacon (basically a giant pig in a blanket) there was no way I could resist. My naughty face as I tuck into my hot dog! It seemed another popular street food are the giant – super giant – ice creams that every tourist seems to enjoy when the sun is shining in Copenhagen. We grabbed a large cone, filled it with as many different flavours of ice cream as we could and enjoyed the refreshing sweet treat while sitting along the harbour. There are some other parts of Copenhagen that we unfortunately missed out on such as the hippie district of Christiana and the Louisiana Museum of Modern Art but as we only had two days in the city we decided to take our time wandering around rather than rushing to fit everything in and it turned out to be the perfect short weekend break. Plus this just means that we have an excuse to go back another time, and this lovely city is most definitely somewhere I’d like to visit again. Loved reading about your weekend because it was quite different to ours… we didn’t manage to get to Tivoli (had planned to on Saturday afternoon but found the very same deckchair harbour & couldn’t resist) and spent all our money on wining and dining – chomping on those delicious hotdogs might have been a smarter move for our credit cards! Haha I’m sure you still found some delicious food though Connie even if it wasn’t the hotdogs! 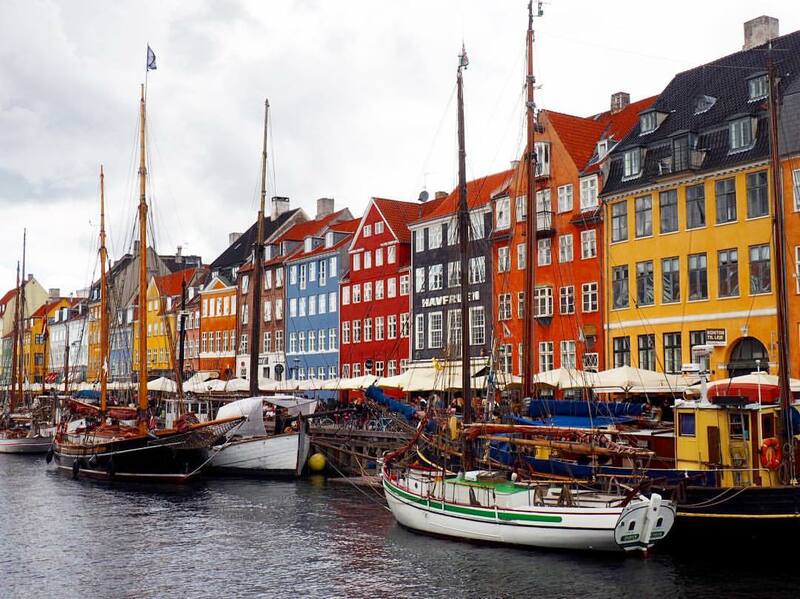 It’s been a while since I went to Copenhagen – such a lovely city. I actually stayed in the hotel behind you in the deckchair shot! Did you see the opera house – it’s a stunning building. No we didn’t see the Opera House so sounds like that will be on our list to visit when we hopefully make a return trip. Isn’t it a lovely city! I think you’d really enjoy Copenhagen Suze. 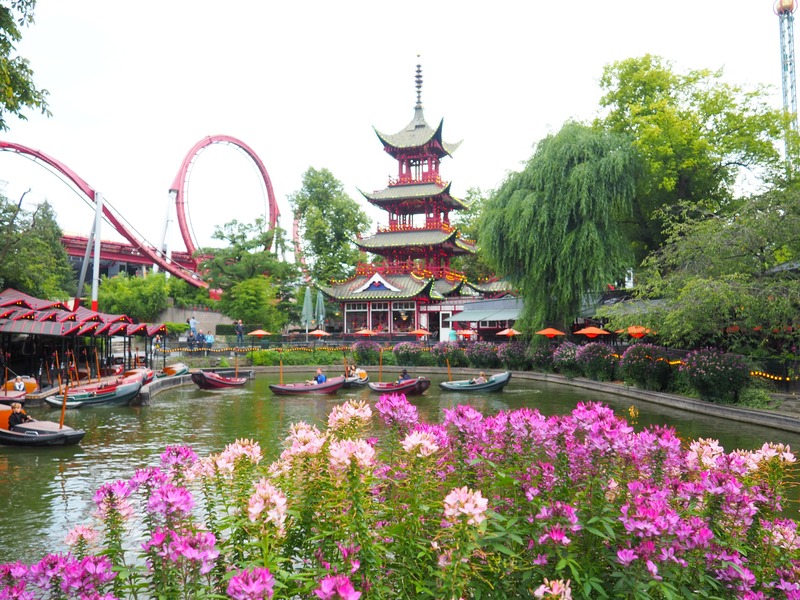 It’s a great city for a weekend break and has some lovely colourful areas! Really want to visit Copenhagen. Looks beautiful. On my list for the next long weekend jaunt without the kids. It’s perfect for a weekend break so I hope you get to visit soon! I want to visit it too! :) nice photos! Ohhh my, tell me about it, CPH is really expensive indeed! I still think I would have had one of those ice creams even in winter! They’re too huge and yummy to say no to! 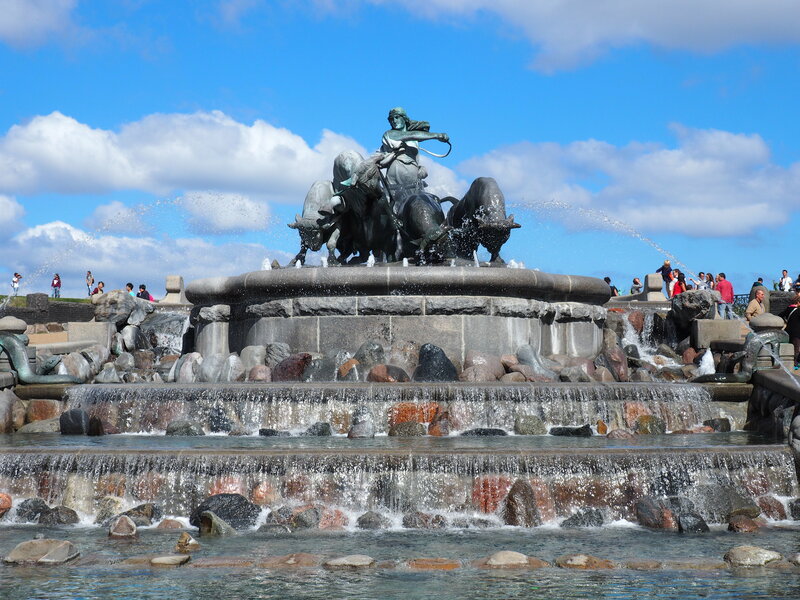 I’m heading to Copenhagen this weekend – I’m so looking forward to it! Thanks for the tips – I’m holding out for one (or several) of those hotdogs!! Several hotdogs are definitely needed. They do a few different varieties so it’s only right that you try them all 😉 Enjoy!